These New Year’s Eve Party Fixings Ready-To-Go examples are actually realistic photographic inserts of the food trays offered. That keeps them looking fresh and appetizing under harsh store lights and ambient temperature levels. They even looked tasty from close up. No need buying expensive realistic food props when inexpensive two-dimensional facsimiles will do. 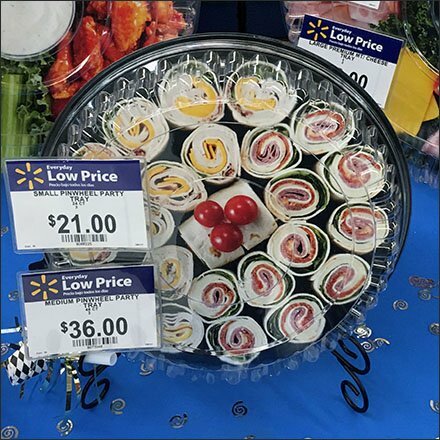 This New Year’s Eve Party Fixings Ready-To-Go visual merchandising seen at Walmart.